A kind,honest, humerous,fun loving person with a positive outlook on life. To meet up for a Coffee/Drink,maybe a walk and see ho we get on ..
Any one that serves drink! jostastic is a Female dating in Laois, Ireland. 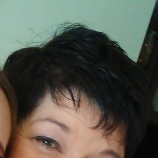 Check the description of this 55 years old profile, she is White/Caucasian and Catholic maybe this matches your profile description and you can both start dating in Ireland for free. The stars says she is a Cancer maybe you should check your horoscope and match up your star sign.